We’re only a couple of weeks into the New Year but the incovo team are already cracking open the Champagne and celebrating success! 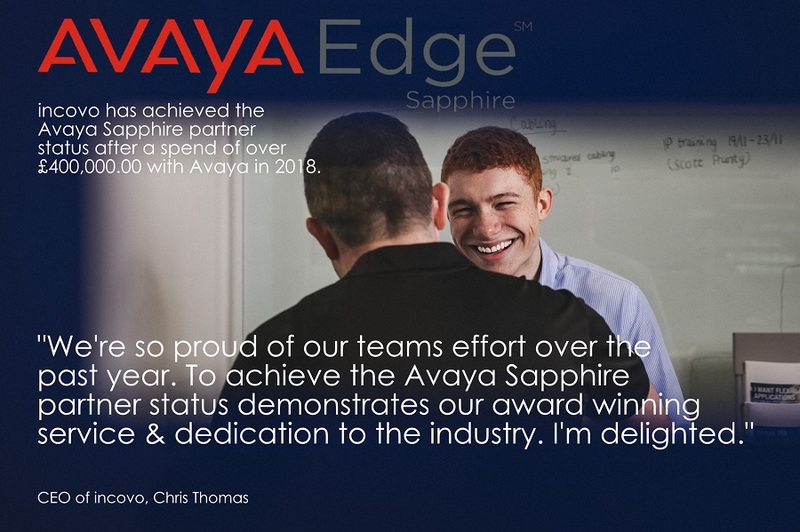 We’ve just been awarded with the Avaya Sapphire Partnership status which is a HUGE achievement in the world of telecommunications – just a handful of UK companies have been awarded this exclusive status. To achieve this impressive milestone, incovo faced rigorous assessments on a variety of factors, including our volume of Avaya customers, their spend, and our customer retention. We’re delighted to announce we came out on top right across the board; our spend with Avaya broke the £400,000 mark in 2018 and we achieved our highest level of customer retention to date. Our customer feedback was also judged to be excellent, thanks to our speedy response times and knowledgeable team members. And the level of technical qualifications achieved by our engineers was also deemed to be outstanding, thanks to incovo’s ongoing commitment to investing in the team’s professional progression. In fact, we now have six fully trained Avaya engineers based in Scotland, with further support in England and Brussels. Our new Avaya Sapphire Partnership status will enable us to offer our customers even more competitive prices on Avaya systems and equipment, and we can now provide increasingly complex solutions to suit more specific business requirements. Following the announcement, Alison Hastings, Head of Avaya UK Channels said, ‘I am delighted to see incovo have been awarded Sapphire Status within the Avaya Partner Program. This is well deserved and testament to their commitment and investment in Avaya solutions, increasing their Avaya revenue by over 160% in the last 12 months. We look forward to seeing more success from incovo and I wish to extend my congratulations to them’. Reacting to the news, Chris Thomas, CEO of incovo said, ‘We’re so proud of our team’s effort over the past year. To achieve the Avaya Sapphire Partner status demonstrates our award-winning service and dedication to the industry. I’m delighted’. We’ve worked hard to achieve this status and our expert engineers and dedicated sales team have done a fantastic job. Thank you to all of our customers who continue to trust incovo to provide the solutions and service we do. With 2019 off to such a promising start, we’re now well on our way to achieving Avaya Diamond Partnership status, which we believe we can achieve by 2020. We’ll make sure the Champagne is on ice for then!